Looking for a getaway in your own city? Or even travelling to Bangalore on work? Step into Casabianca — a Spanish/ Mangalorean style villa in one of the most happening parts of the city. 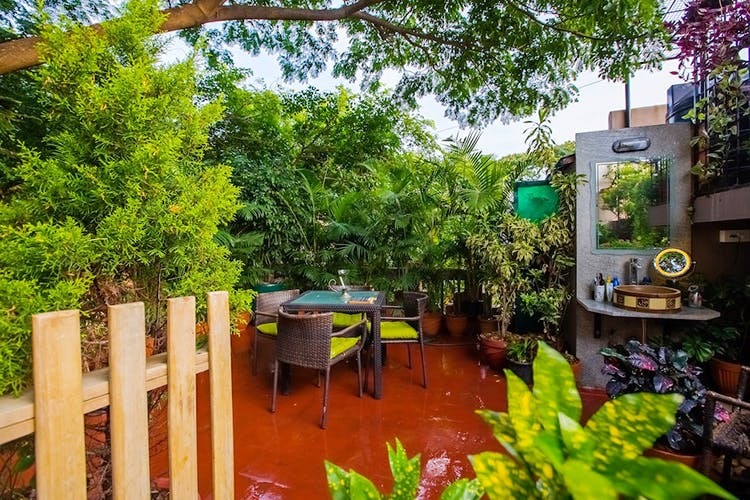 This villa lets you experience the buzz of the city, while also being tucked away in one of Koramangala’s quiet tree-lined streets. The house is a gorgeous blend of Spanish and Mangalorean architecture. Located in the green and serene environment of Koramangala, the villa is located right by a park giving it a very countryside vibe. The rooms itself are very spacious and furnished with elegant decor, and each come with an attached personal bathroom. There are in total seven rooms up for rent. As far as, Alok, who is in charge of renting out the property, is considered ‘mi casa su casa’ so apart from the exclusive access to your room you will also have shared access to the rest of the house as well (barring the other rooms). Take full advantage of their high-speed internet, fully equipped kitchen, washing machine and the rest of the spaces such as the ground floor library, first-floor lounge, second-floor terrace and one of our favourite their beautiful terrace garden. Get cosy on the hammock or lay back on the rocking chair that overlooks the park. Share a beer and a few stories up on the pretty terrace of the place. With wonderful staff that ensures your rooms are clean and you’re well fed at all times, you’ll definitely be well taken care of here. Breakfast is complementary and other meals come at extra charges. Rooms start at INR 2,200.